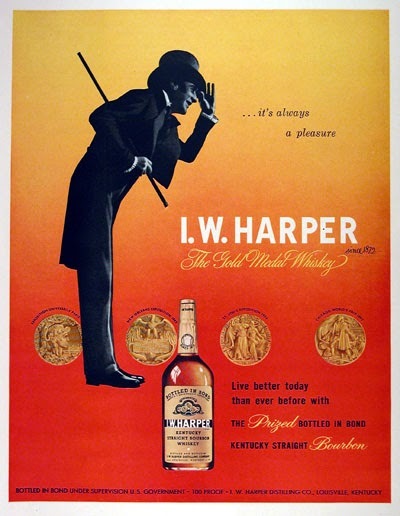 Diageo announced yesterday that it is bringing the I. W. Harper Bourbon brand back to the United States after about a 20 year absence. The first releases will be I. W. Harper Kentucky Straight Bourbon Whiskey (NAS) and a limited edition I. W. Harper 15-Year-Old Kentucky Straight Bourbon Whiskey. Associated Press Food Editor J. M. Hirsch got to break the story and received some information the rest of us did not. The NAS product will be 82° proof (41% ABV) while the 15-year-old will be 86° (43% ABV). Diageo says bottles should start to appear in stores by the end of this month. It's all happening very quickly. They haven't even finished the press releases yet. I. W. Harper is a very important brand historically. It was launched in 1879 by the Bernheim Brothers, Issac and Bernard. Issac was older and president. "I. W." were his first two initials, but he hesitated about using his own real last name and went with the safely Anglo-Saxon 'Harper' instead. I wrote at length about Bernheim in both Bourbon, Straight and my new book, Bourbon, Strange. The brothers had two distilleries in Louisville, the first one in Shively, the second in west Louisville where Heaven Hill's Bernheim Production Facility is today. The brothers sold the company when they retired. After Prohibition it became part of Schenley, which became part of the Guinness roll-up that created what we know as Diageo today. They tore down the old distillery and built a new one in 1992, then sold it to Heaven Hill in 1999. It was about 1990 when I. W. Harper Bourbon was withdrawn from the U.S. market. It was by then a cheap, bottom shelf brand here but had, remarkably, become the best-selling bourbon in Japan, where it sold at a premium price. So great was the price differential that clever entrepreneurs began gray market exporting it, buying it at U.S. prices and shipping it to Japan outside of sanctioned distribution channels. The only way to stop them was to kill the brand in the U.S. It returned briefly a few years later as one-fifth of the Bourbon Heritage Collection, as a super-premium called I. W. Harper Gold Medal, a 15-year-old. When Diageo bailed out of bourbon in 1999, that product was one of the first casualties. It hasn't been seen in these parts since. Though no longer number one, I. W. Harper Bourbon continues to do well in Japan and other non-U.S. markets. In 2012, I. W. Bernheim was inducted into the Kentucky Bourbon Hall of Fame. In retirement, Bernheim became a major philanthropist. Probably his greatest gift was the 10,000 acre nature preserve in Bullitt County known as Bernheim Forest. He and his wife, and one of his sons, are buried there. Although open to the public it is privately owned by the Bernheim Foundation. A formal unveiling of the new products will be held next week at Bernheim Forest. 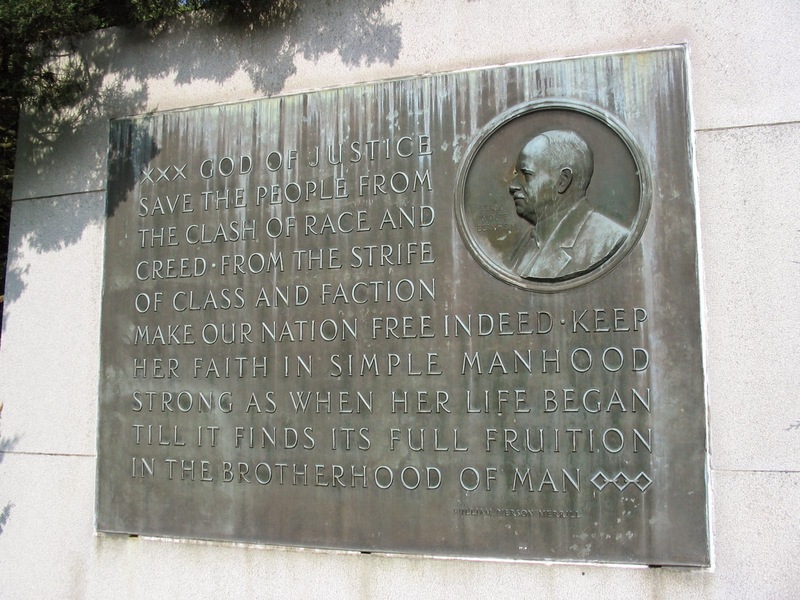 The I. W. Bernheim Monument at Bernheim Forest; Clermont, Kentucky (across the road from Jim Beam). I. W. Harper Bourbon was notable for having an extremely low rye content, about eight percent. That's not unprecedented. When Diageo was making both brands, Old Charter was the same distillate. Both Jack Daniel's and Diageo's own George Dickel have comparable mash bills. Although they don't reveal their mash bills, the Buffalo Trace rye-recipe bourbon mash bill is believed to be similar. Hirsch's source says the two releases have different mash bills, the NAS is 73 percent corn while the 15-year-old is 86 percent corn. Diageo American Whiskey Ambassador Doug Kragel also told AP that some of the 15-year-old is from New Bernheim, presumably made between 1992 and 1999.
Who made the rest of it? We're told it will be essentially the same product they've been selling outside the U.S. I don't expect them to tell us the other sources, but in recent years Diageo is known to have purchased large quantities of bourbon distillate (e.g., millions of proof gallons annually) from Four Roses, Brown-Forman, Jim Beam, and Barton, which it aged at Stitzel-Weller. No one will confirm this, but the information is from a superb source. The warehouses at Stitzel-Weller are being emptied now because of the fungus issue. That appears to have been what brought the Orphan Barrels to market and it may be driving this move too. Although the product remains to be tasted, it is always nice to welcome an old friend back home. There must have been an international component to those gatherings, because I. W. Harper was definitely out of the U.S. market by then. I like seeing an old brand return, but I'm unlikely to buy a four-year-old, 82 proof bourbon for what sounds like $30 (at least based on the article). It'll be interesting to see what it goes for, but that's steep. I have 2 bottles of I.W. Harper President's Reserve found at a duty free on the Mexico side of the Texas/Mexico border 10+ years ago - and a 15 y/o too. I wonder how collectible they've become. I'm sorry if this is a dumb question, but what does NAS stand for? Just taste the stuff...that's what it's for! Maybe nobody had the heart to tell the guy in the spats that his services were no longer needed. I actually couldn't stop laughing when I read this:). So let me get this straight, a company has come out with a new brand that is 15 year old bourbon ? What the heck was it for the other 14 years, 364 days? Let me guess, an orphan ? How do they even make this stuff up ? Holy crap, more excess inventory that wasn't sold under brand X, so now it's new brand Y, but it's the same thing. You want to know how you bring a legitimate 15 year old product with its brand to market ? You do it today, and then when it's ready in 2030, you offer it for salle. Period. Hey anon.....its Diageo. All of their marketing is smoke and mirrors anyway. Think the new stuff will taste like the old Harper of days gone by? Probably not. But how many out there will really know any better? I fondly remember purchasing and drinking IW Harper 100 Proof in the 60's and 70's with my buddy. The old adage, "you can't go home again" applies here. How can you replicate an old bourbon? I've been told that the men in our family have been drinking I.W. Harper for generations. It was the first liquor I tasted. I'll be able to tell if the taste has changed in a second. Even when Old Charter as sold, you could not get it outside the Southern States. The closest I found was The Buffalo Trace Distillery's Antique. It is 100 proof. When I.W. Harper went off the market in the US, their 90 proof was the better stuff. I ordered two bottles of the new 86 proof that has been aged 15 years. I'm counting on it being nearly the same as the old one I remember. Tried all 4 Harper expressions at Newberry's Prohibition Bourbon Bar in Newport, Kentucky, and all are different. The old 15 year old Heritage is top shelf! KDA Wants to Own "Drink Kentucky Bourbon"